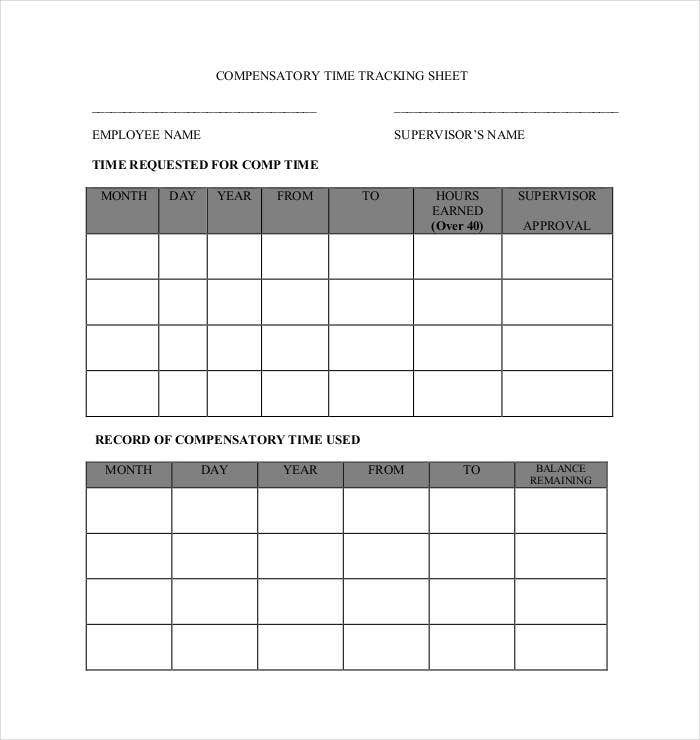 Accounting for time is always an important aspect that every person has to keep in mind. 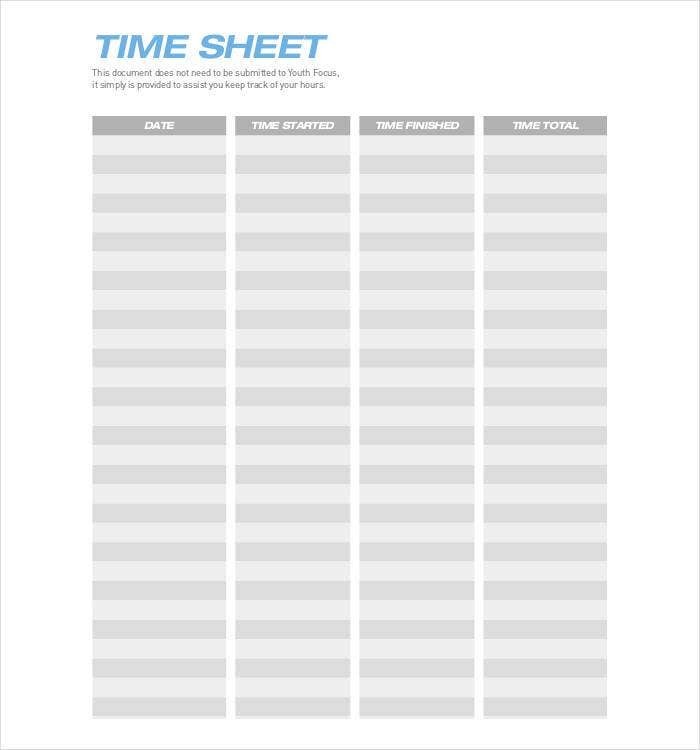 Wasting time is never a fruitful move, and if you do not have a plan on how you are going to spend your time, you will more likely find yourself spending your time the wrong way. 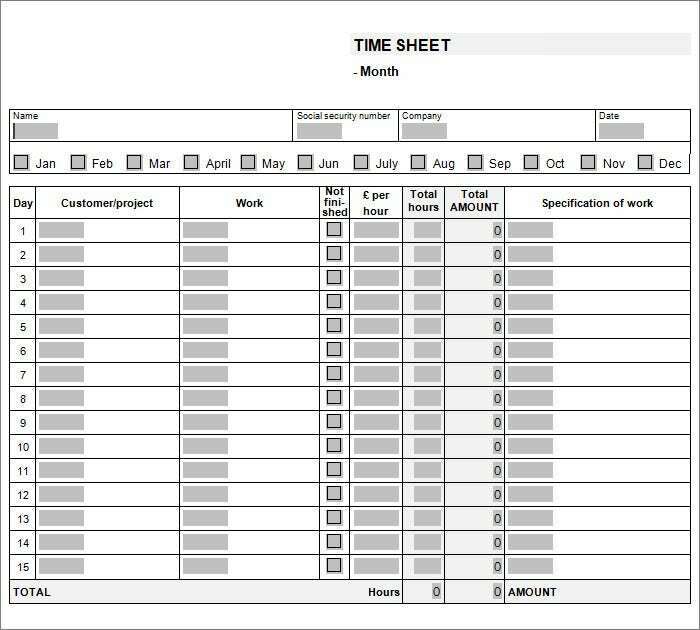 A timesheet templates is an important tool that can help you plan, spend and account for the time you have spent on a particular session or task. With so many activities to perform, it may get quite strenuous for you to take it all in. 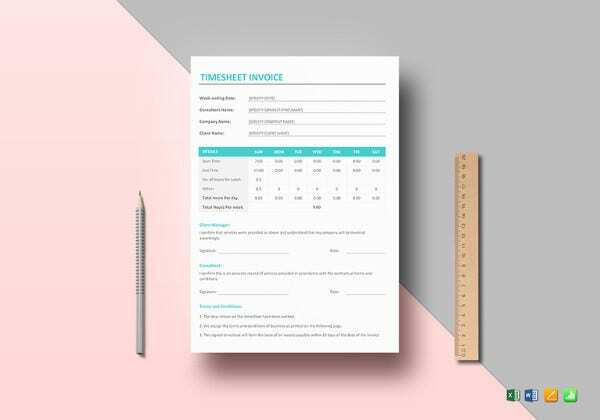 You may get tired along the way or miss on something important because your mind will always be pre-occupied on how to finish a certain task rather than how much time to spend on it. And the problem is, you can never tell how much time you are spending on something if you have not planned for it. 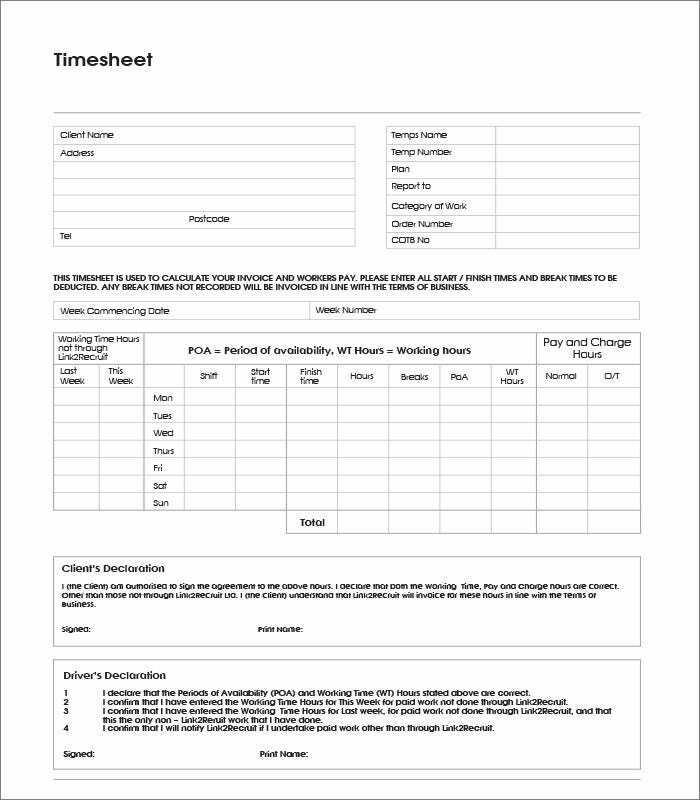 You may also see timesheet templates in pdf. Change the gear this time. 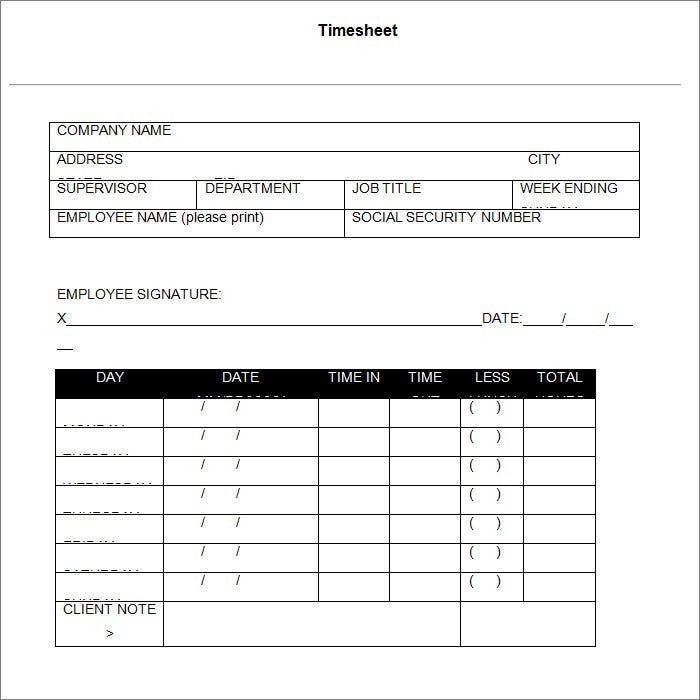 Pick another move and get started with sample timesheet template, the perfect tool, which helps you account for your time the best way possible. 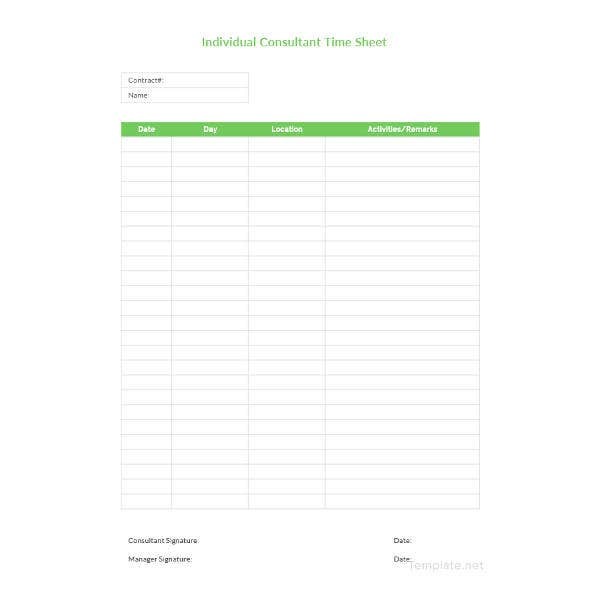 With the free monthly timesheet template, you will be able to write down all the activities that you intend to do, and then allocate how much time you are going to spend on each task. 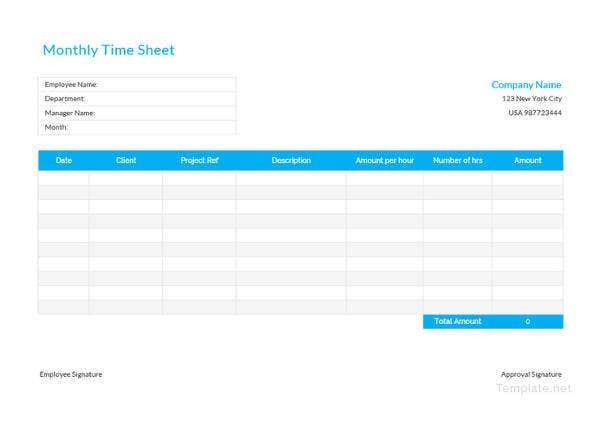 You can always modify the time and task any time you so wish so that the timesheet suits you best. 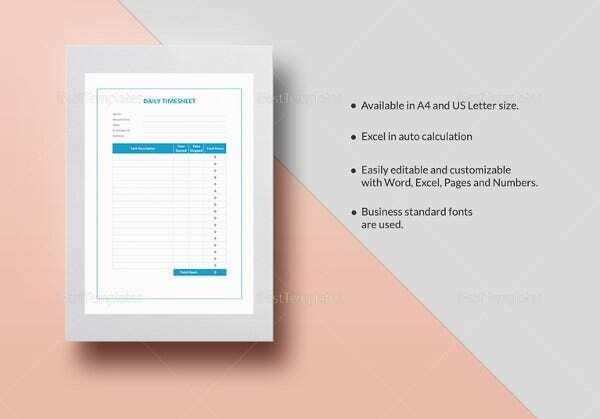 The best bet is that you will find these quite useful from time, and the best thing is that you can always reuse them. 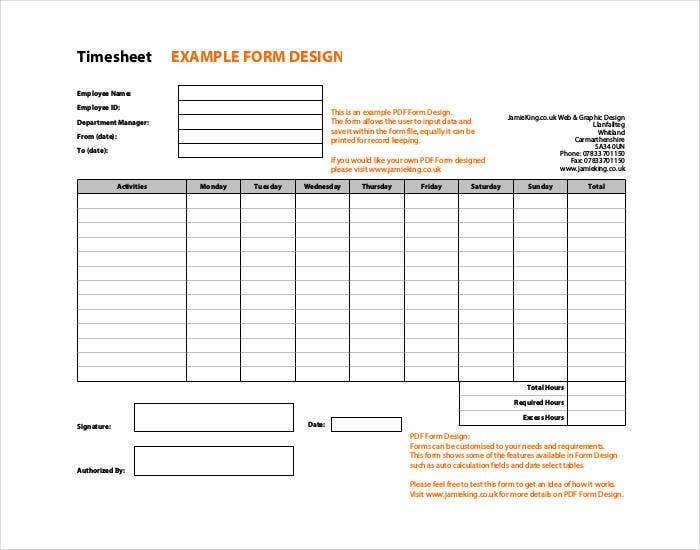 How to Write a Timesheet? 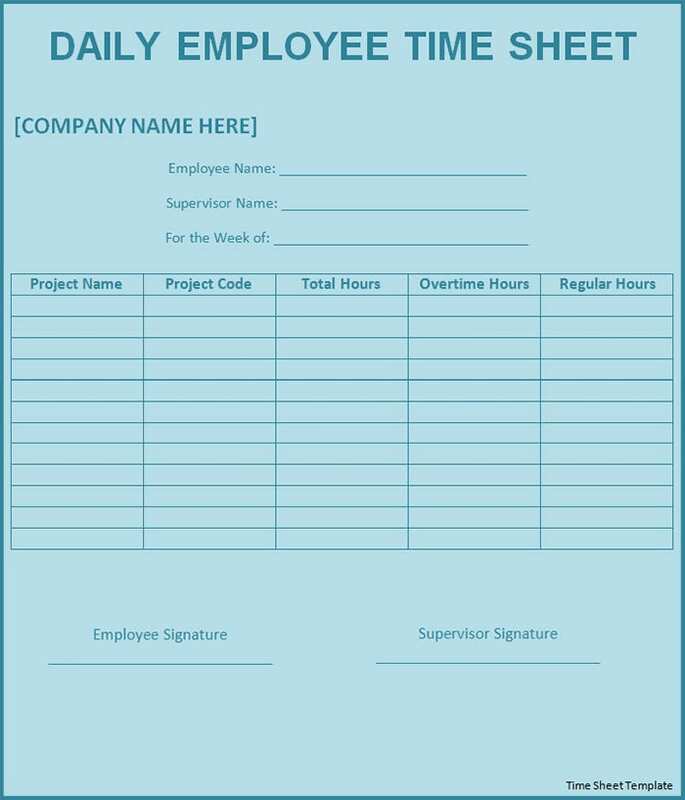 In a company, employees have to work on different projects at different times. Sometimes, they need to work on multiple projects together. 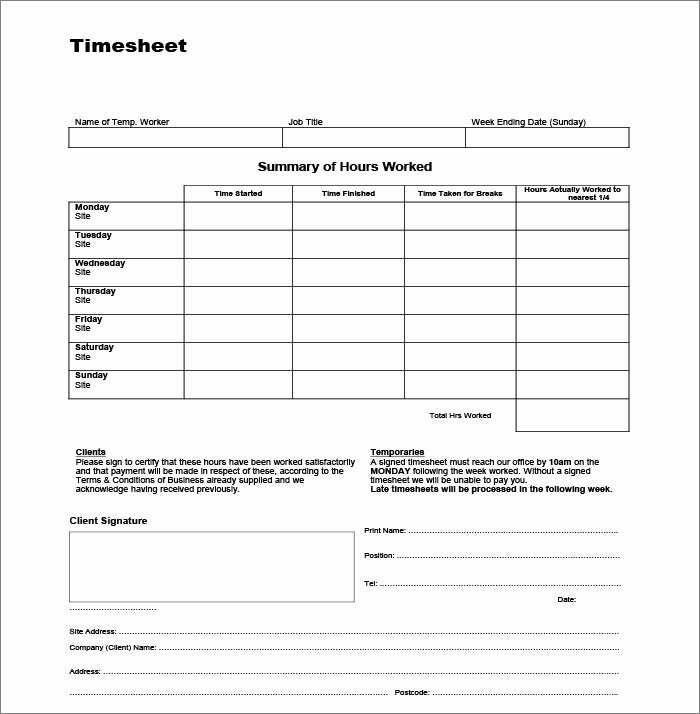 Timesheet is an important aspect in professional life so that proper time management and reporting can be done. 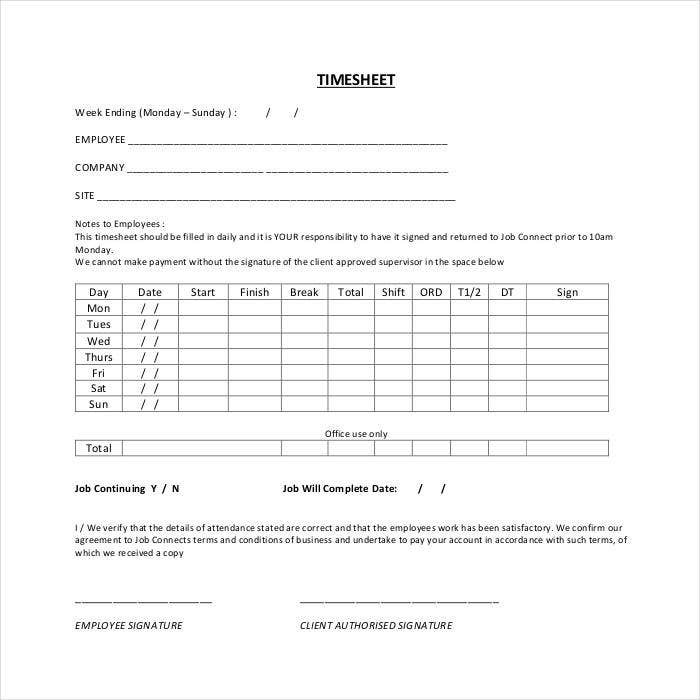 Most of the times, management officials and managers send timesheets in word to the team members. 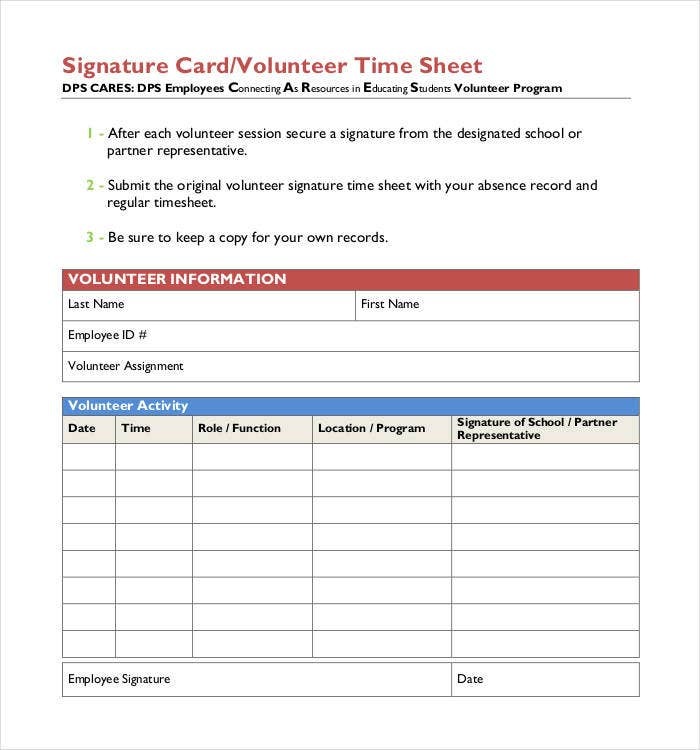 They can complete certain tasks in due time and report accordingly. 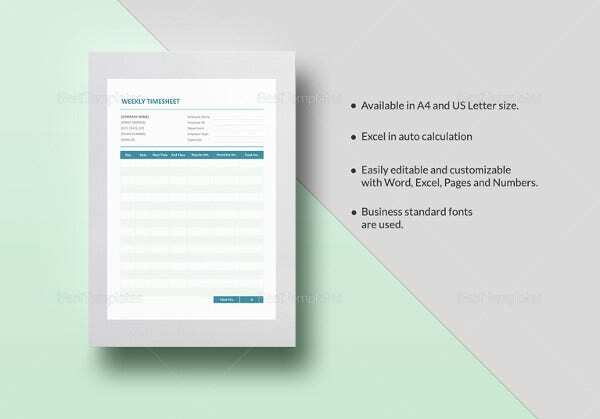 Excel timesheet is the most popular method where Excel files are maintained and sent from time to time to the managers. 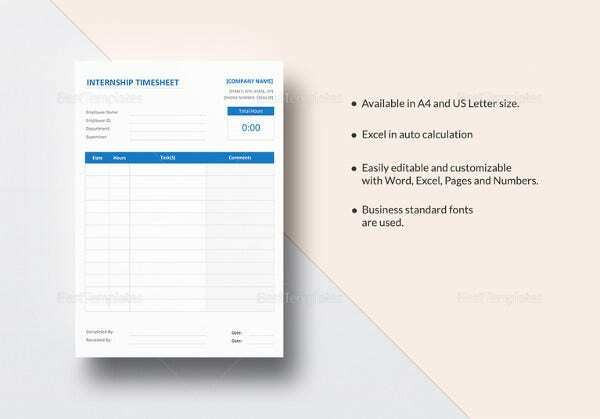 But with digitization, companies are making websites so that timesheets are available online and employees can log in and report. 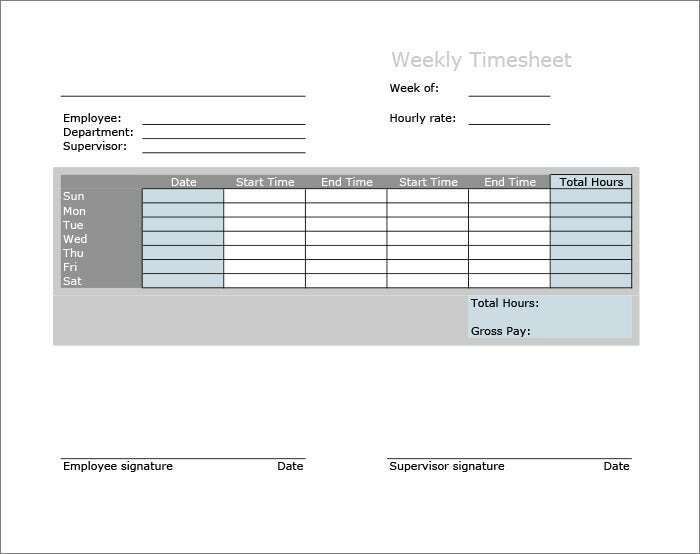 Bootstrap timesheets are most popular, and there can be daily, weekly and even Monthly Timesheet Templates available. 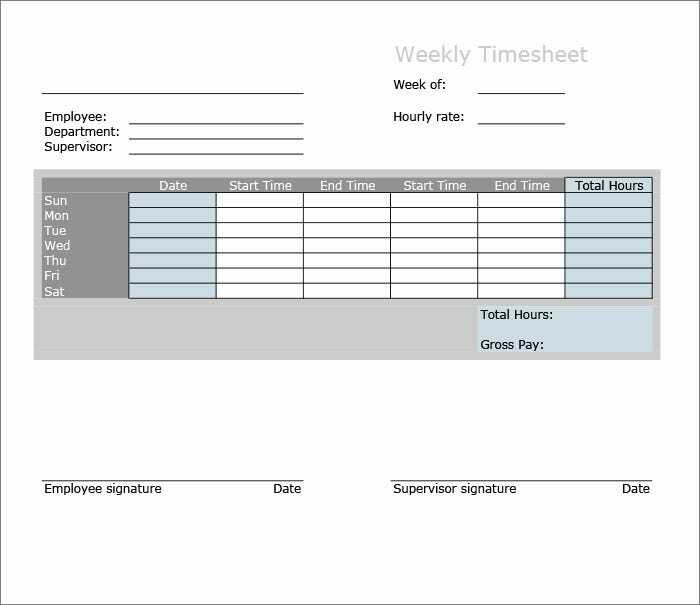 How to Make a Timesheet in Excel? 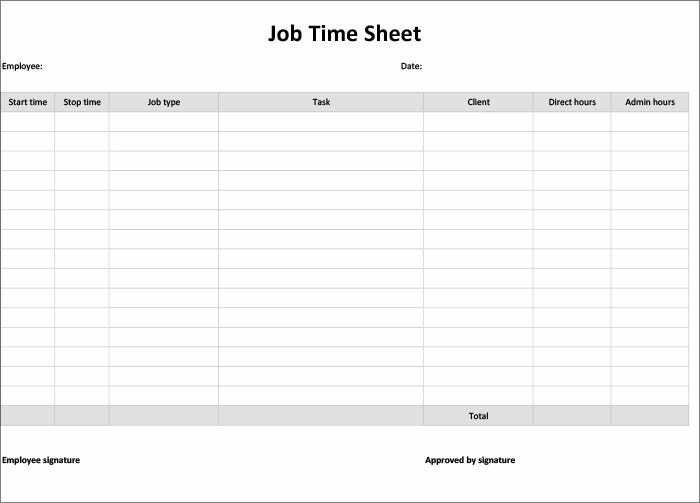 Preparing a timesheet in Excel is so easy. 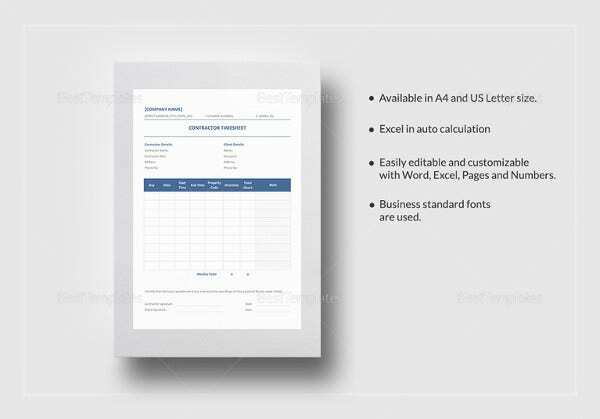 You can either do it yourself, or you can download templates for faster processing and better presentation. 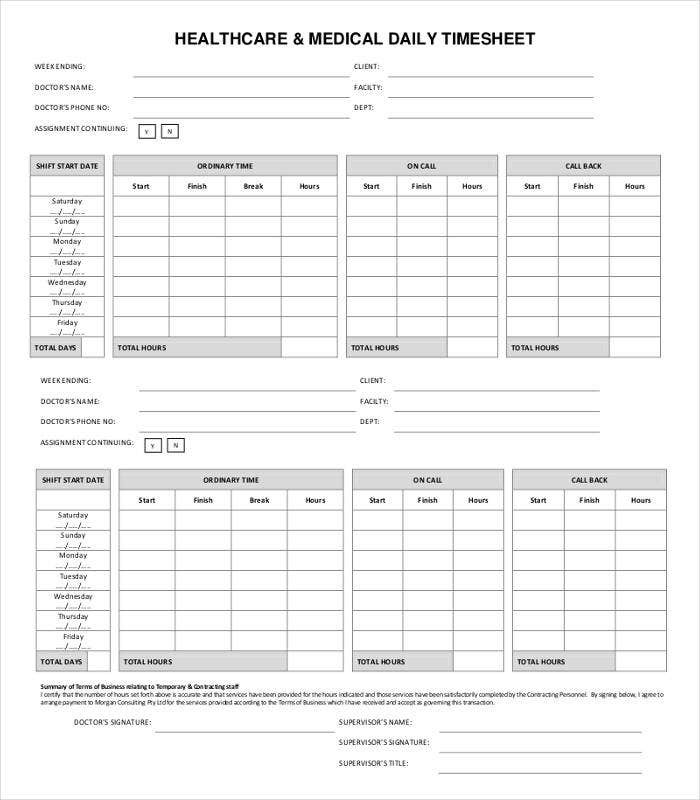 Basically, you make a make a table with proper labels and headings. 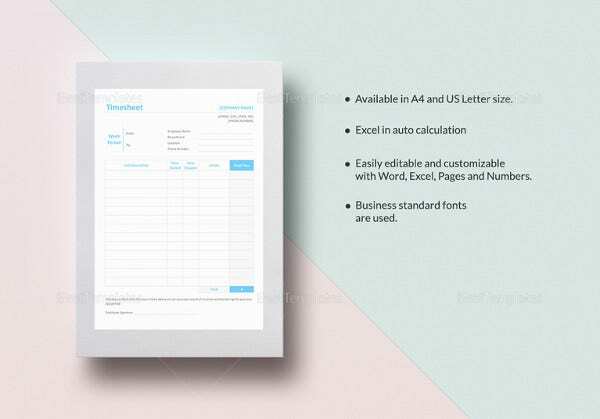 If you are not sure which labels to have, you can refer to samples. 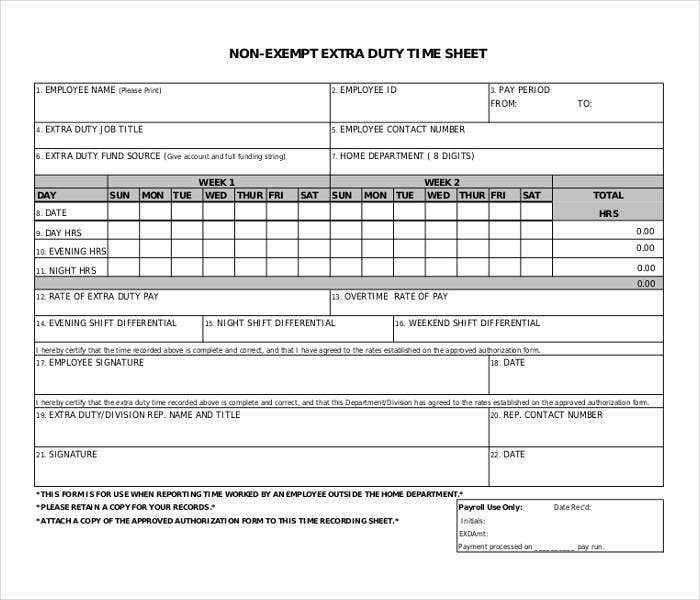 In the case of the daily timesheet, you need to have sections like morning, afternoon and night in case you are going to overtime. 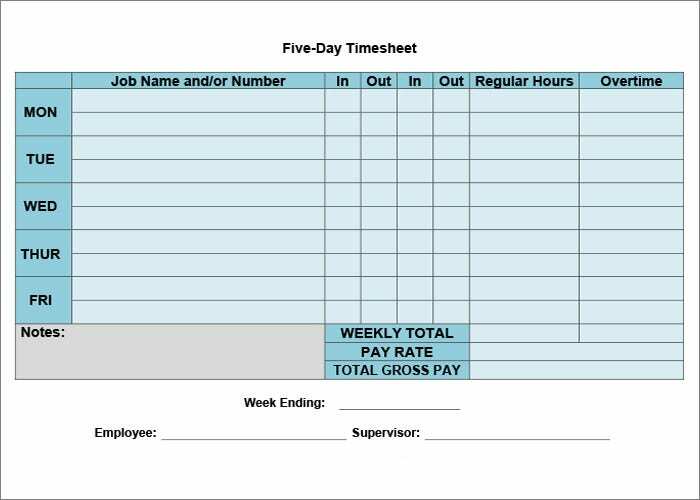 You have to mention the total working hour and the work or module you have worked on. Sometimes, specific points are to be mentioned. 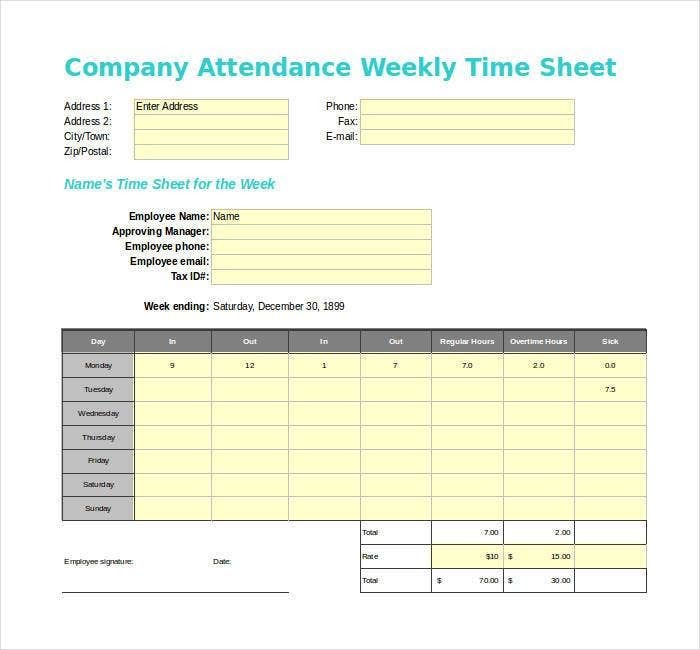 Companies generally provide timesheet to their employees that are downloaded like Attorney Timesheet Templates, IT timesheet templates, graphic design timesheet templates and general timesheet templates. 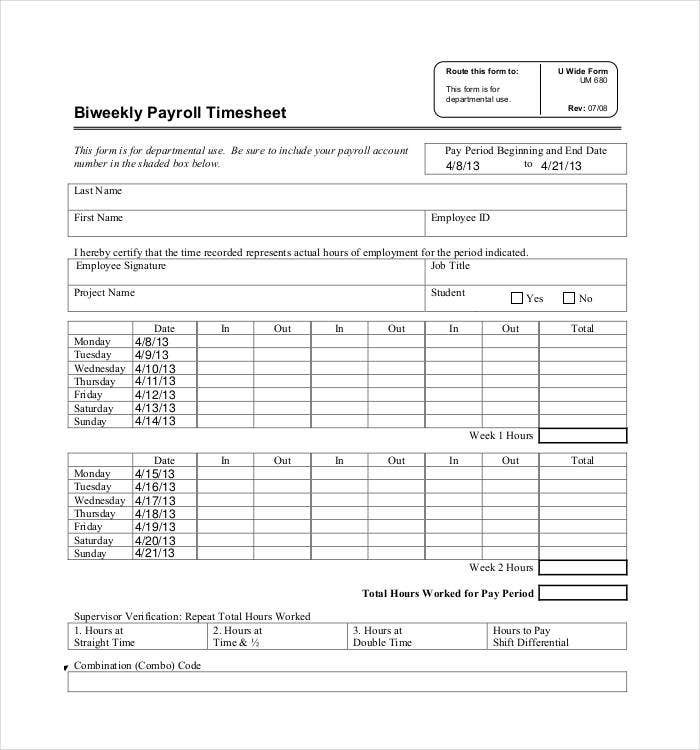 Timesheets to print are readily available for final reporting. 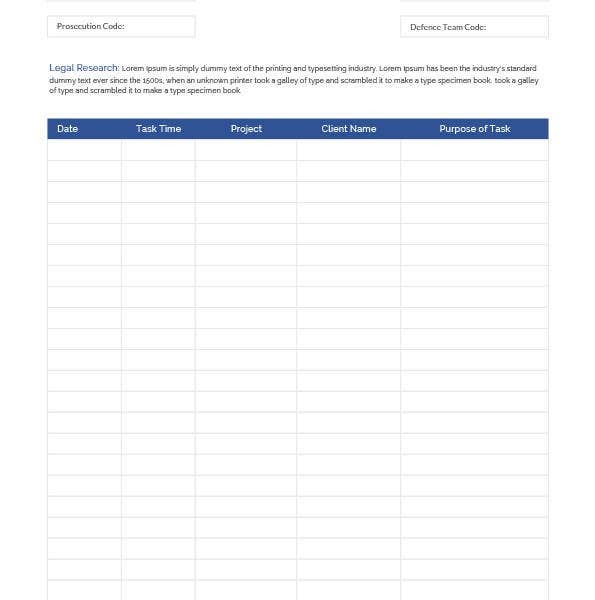 Managing a big business and unable to keep every small things in mind on regular basis? Need not to worry; we have solution also for that. 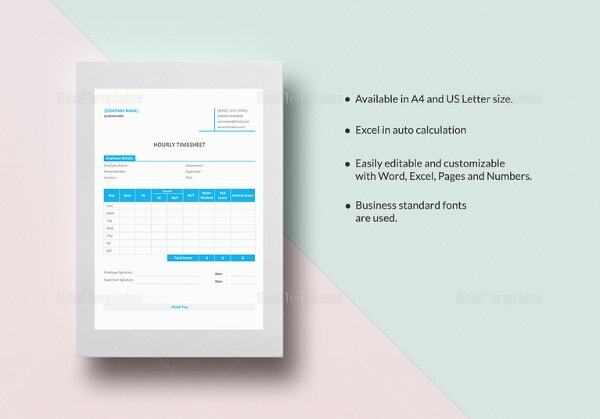 Our weekly printable timesheet template is one very simple and easy to maintain. 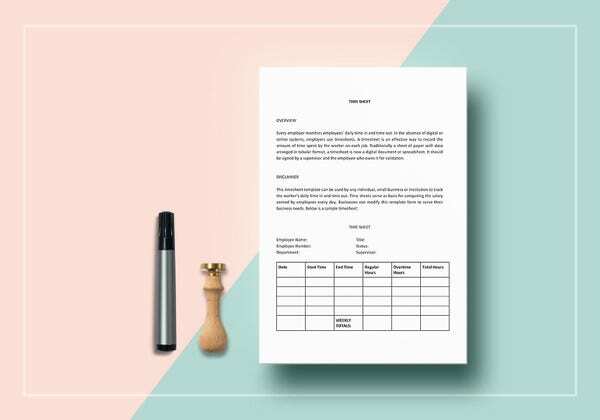 It is a routine like template with space for noting the name of the job, in and out time, regular hours of work and also over time if necessary. 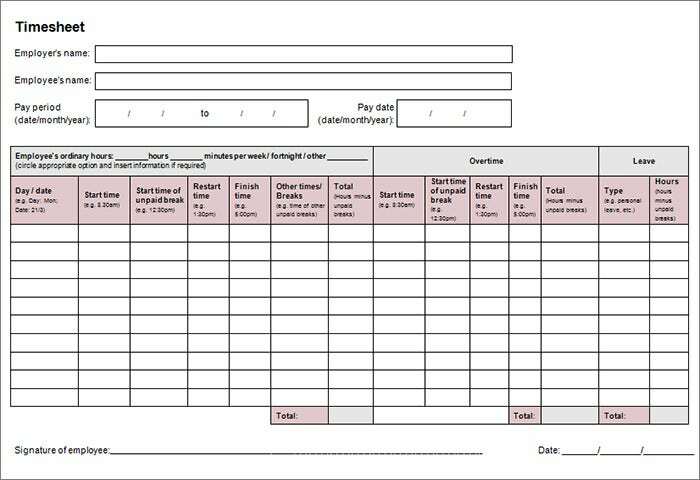 It also gives the opportunity to calculate the pay for the entire week and also has a space for any remarks if so. 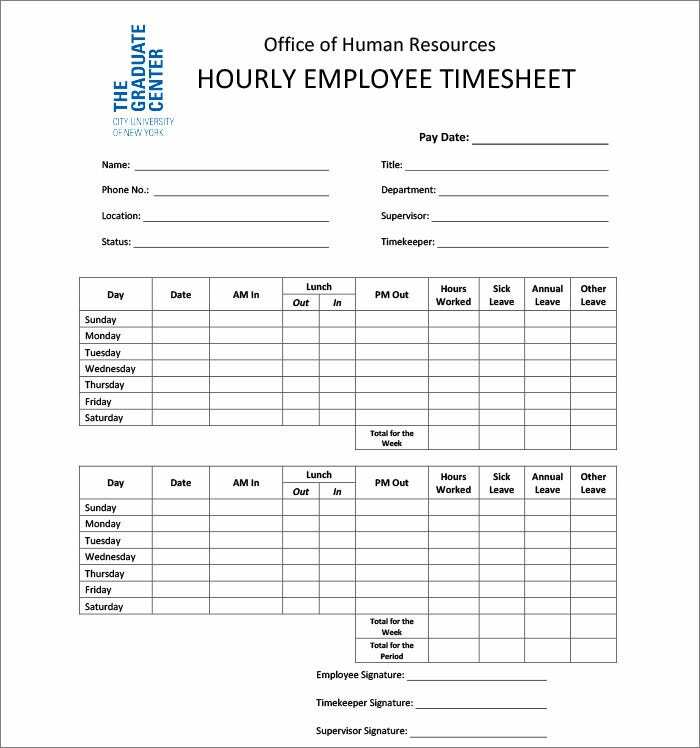 You may also see hr timesheet templates. 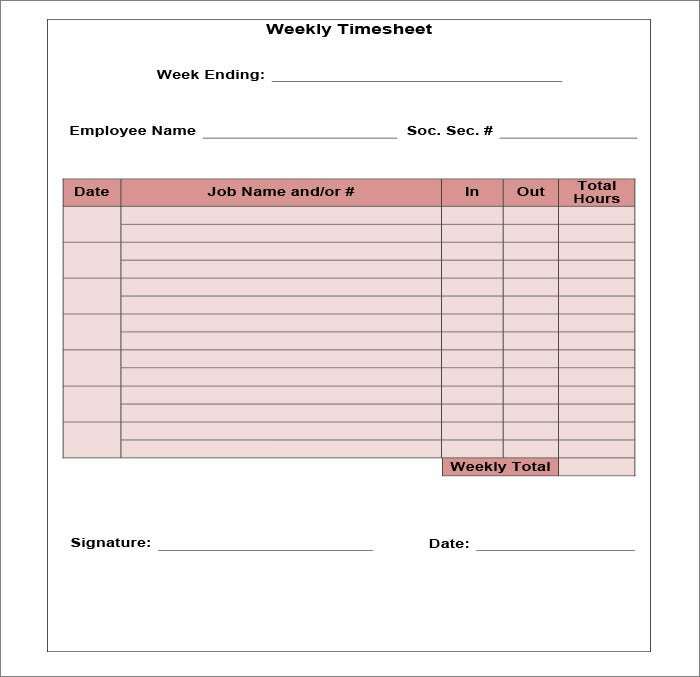 This Bi-weekly Employee timesheet template is a unique one in the category. 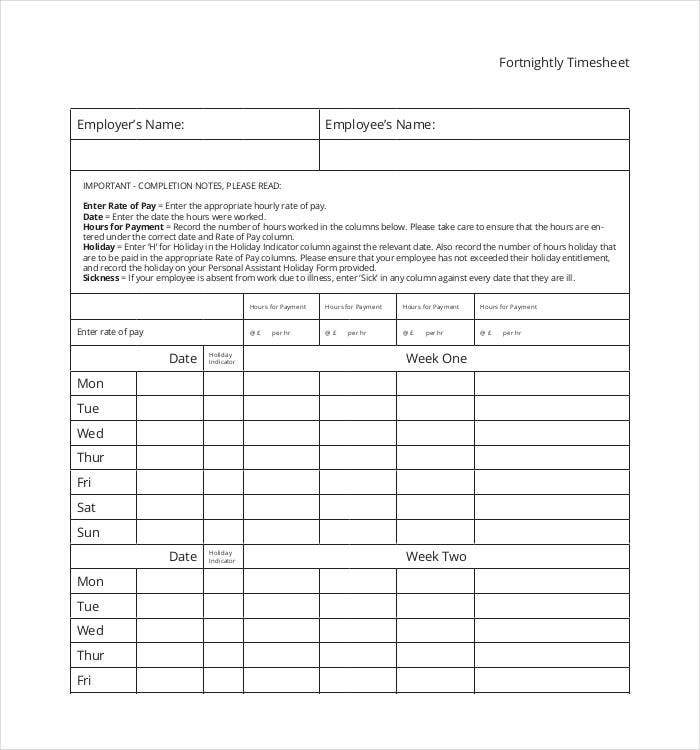 Along with all other details to be listed like name of the employee, company name and address, time in and time out, the time when the lunch break starts and when it ends is also listed in this template. 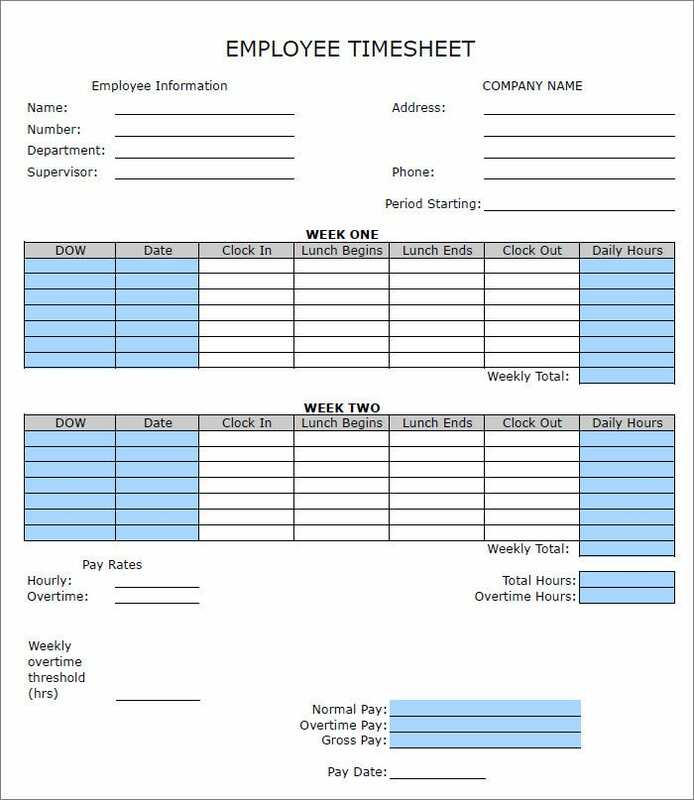 It consist space for all small details like normal pay and overtime pay with weekly overtime threshold. 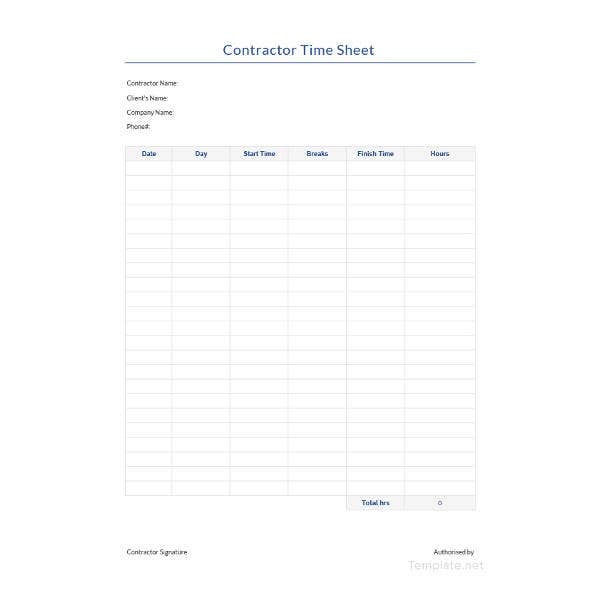 You may also check out here consultant timesheet templates. 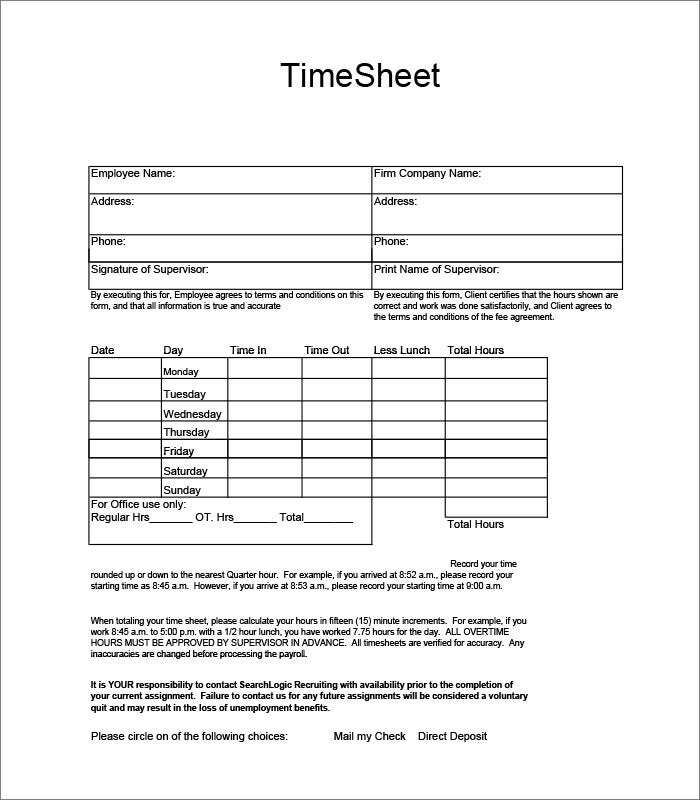 What is Time Sheet Management? 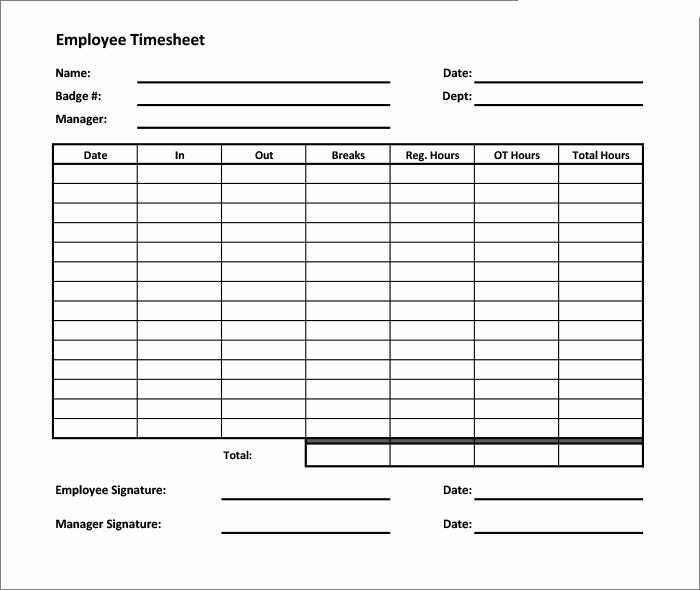 Timesheet management is an important part of corporate life. 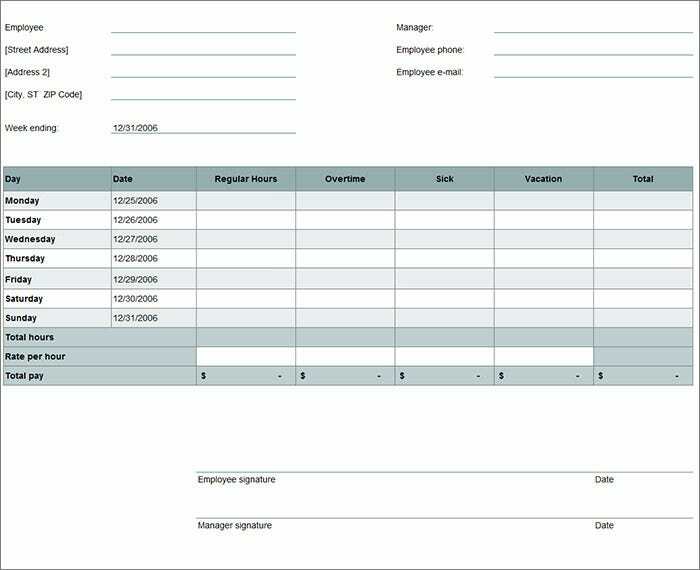 Previously, manual timesheets used to be collected, reported and stored. 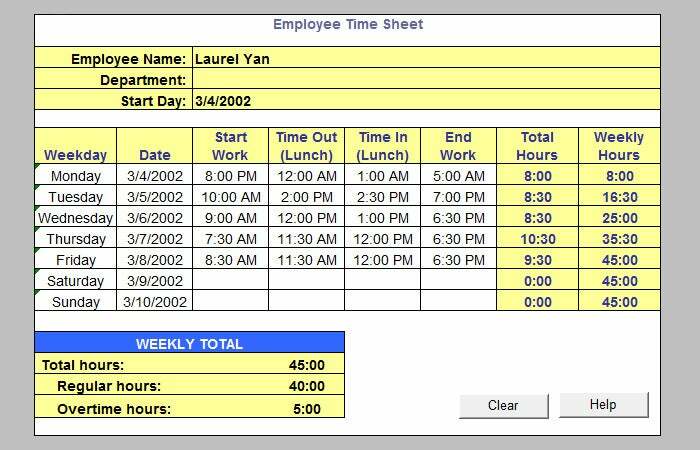 Then excel timesheets came in and employees used to send timesheets through email to the managers. 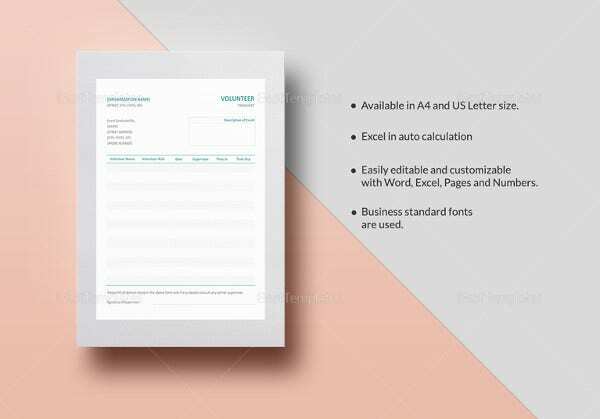 They could also take printout and provide them when it may require doing so. 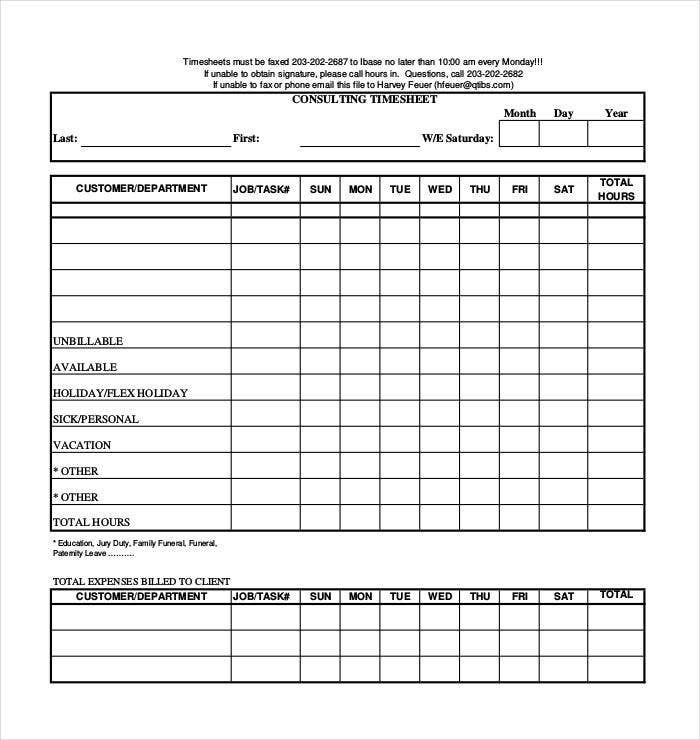 Now, timesheet management has become rather easy due to digitization. 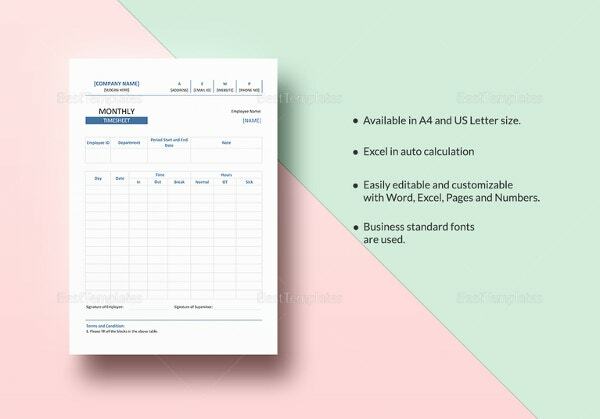 You may also see numbers timesheet templates. 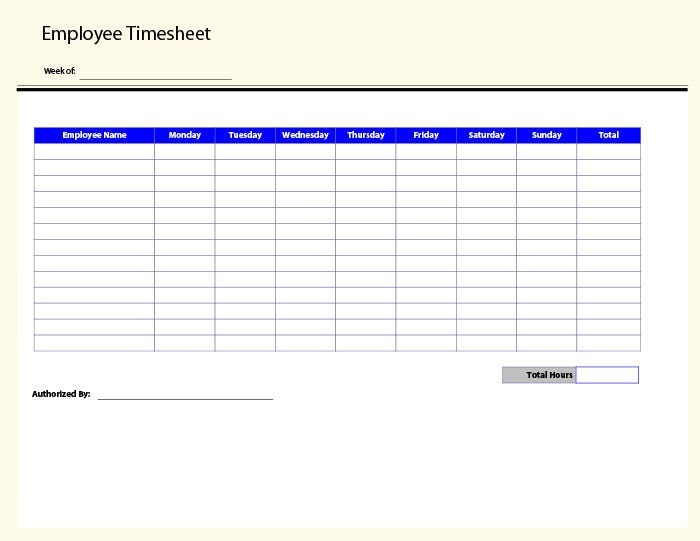 Websites are available to upload timesheet related information by every employee through their accounts. 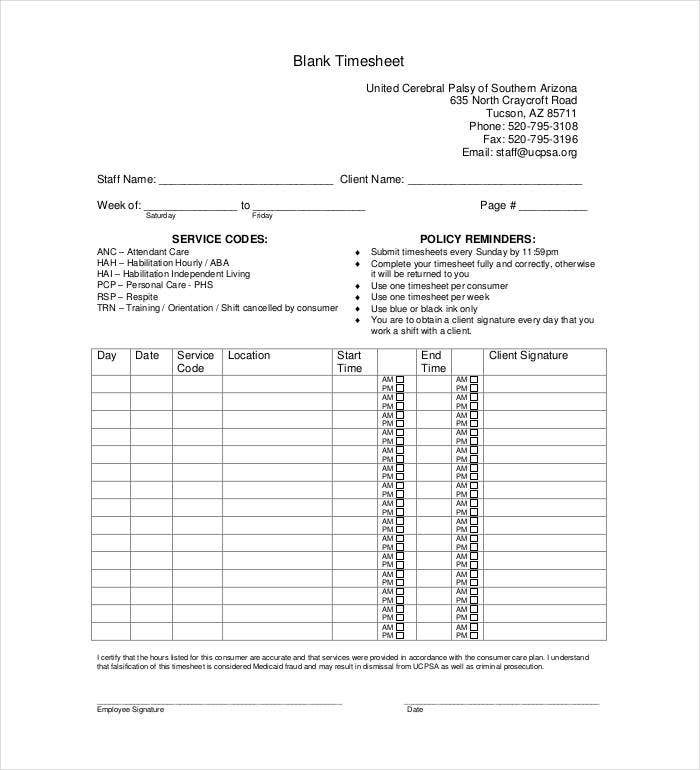 Management officials can check the record anytime from anywhere, and they are saved in the cloud system. There is backup system, and it is easy to filter through them via various queries. 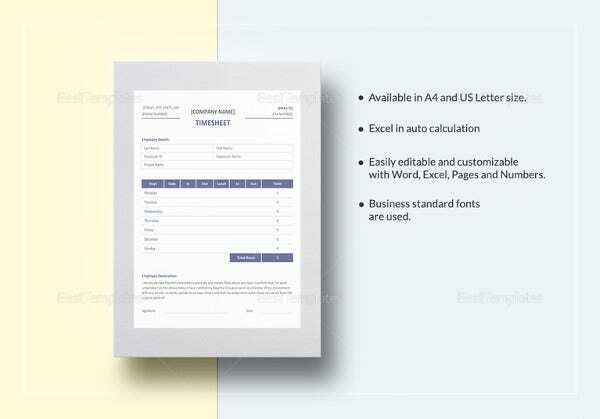 There are Joomla templates available for design such websites using daily or Weekly Timesheet Templates. 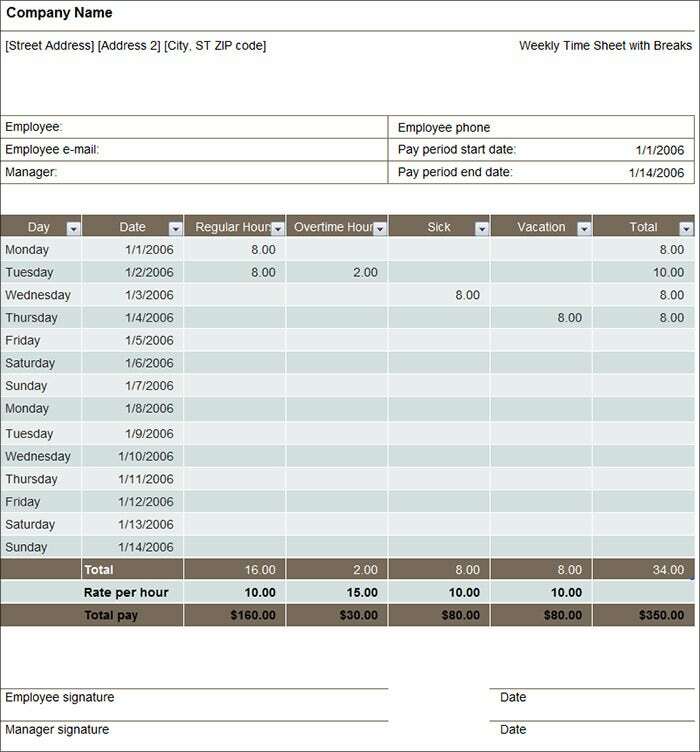 Payroll timesheet is different from general timesheet. 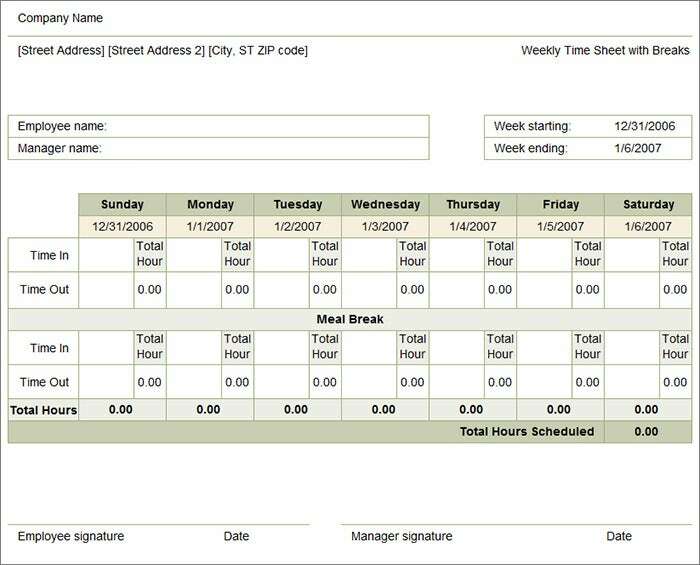 Payroll timesheet is used to record the total working hours in a day by the employees. 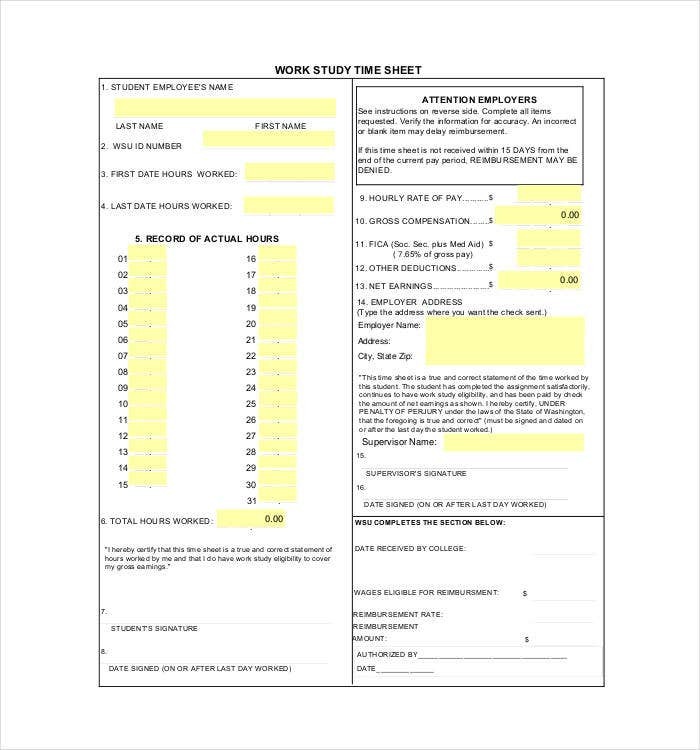 Then at the end of the month, total working hours are calculated and accordingly, payment is paid. 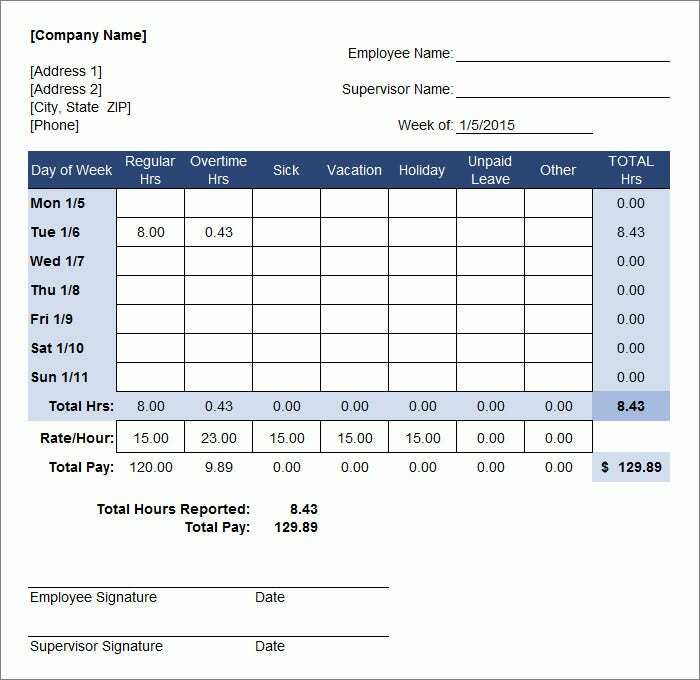 Payment can be on the hourly basis or fixed basis and extra incentives for overtime. 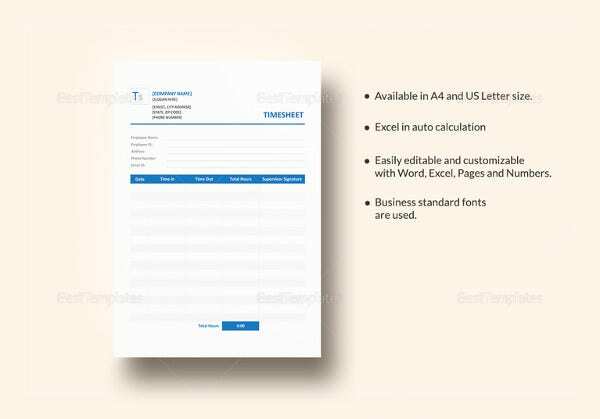 Generally, excel timesheet templates are used for this purpose as it bigger companies, they have advanced login system where the attendance hours are recorded automatically due to the punching of identity card. 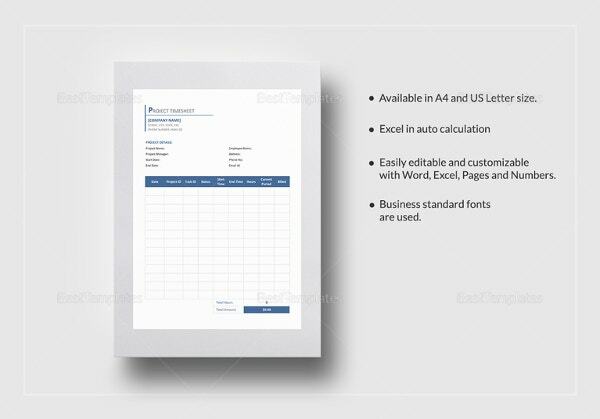 Preparing Excel timesheet are easy with templates, and you can personalize them according to your requirements to increase the company or brand value. 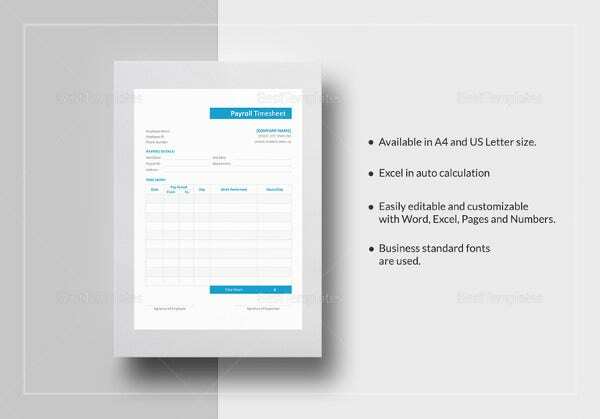 The time sheet templates are absolutely necessary for any working organization. 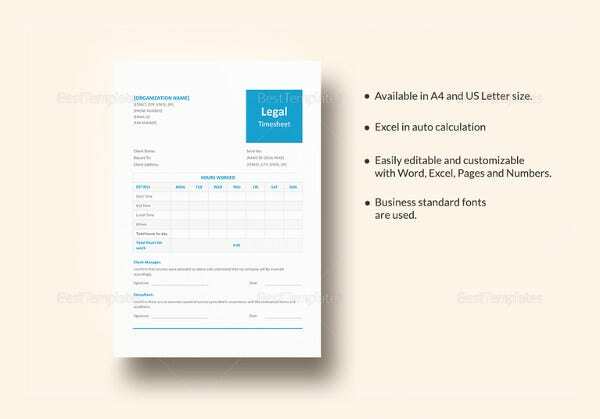 There are templates available for download for all different types of companies like IT, industrial, graphic design, Legal and Lawyer Timesheet Templates. 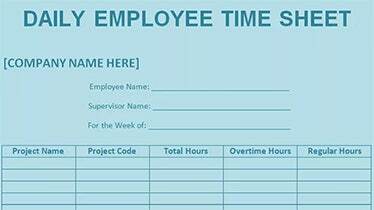 It helps to ensure that the employee works the right duration of time. 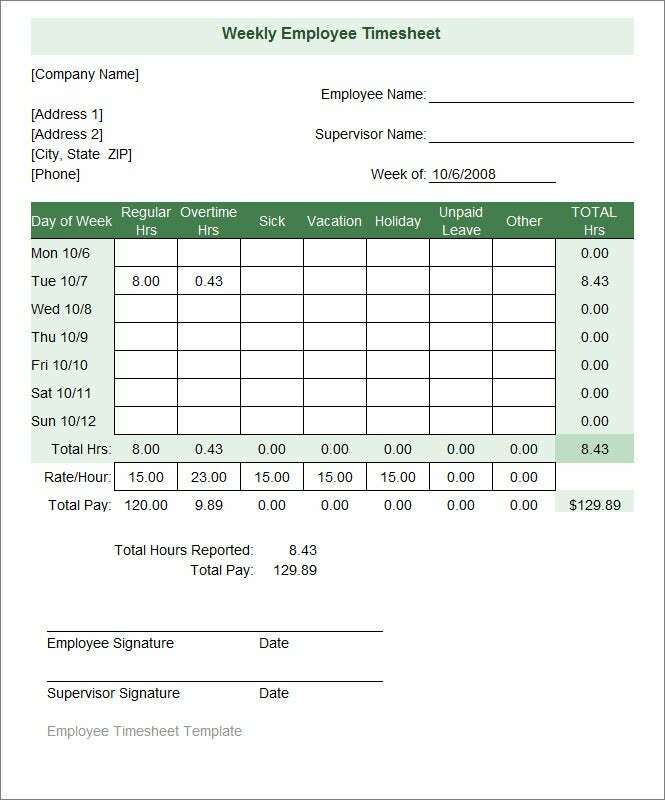 If they work overtime, they could register that and get paid accordingly. 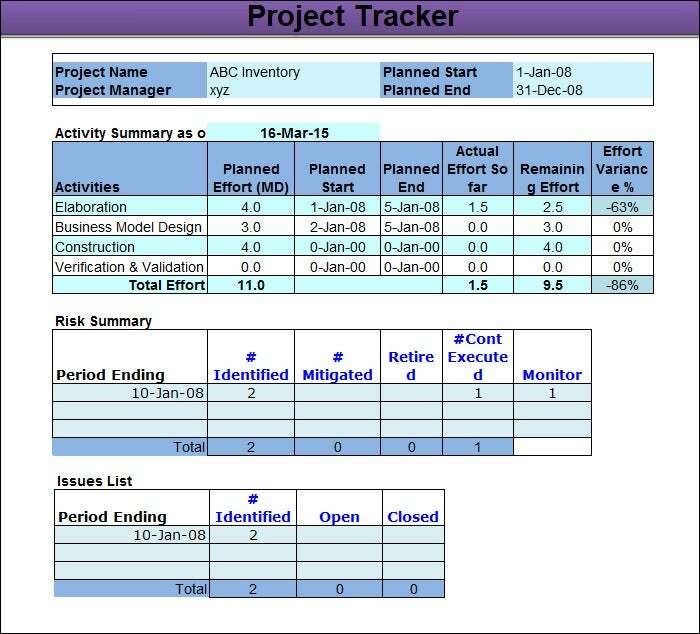 It helps the managers to keep proper track of the employees and also defining them time period for solving a module. 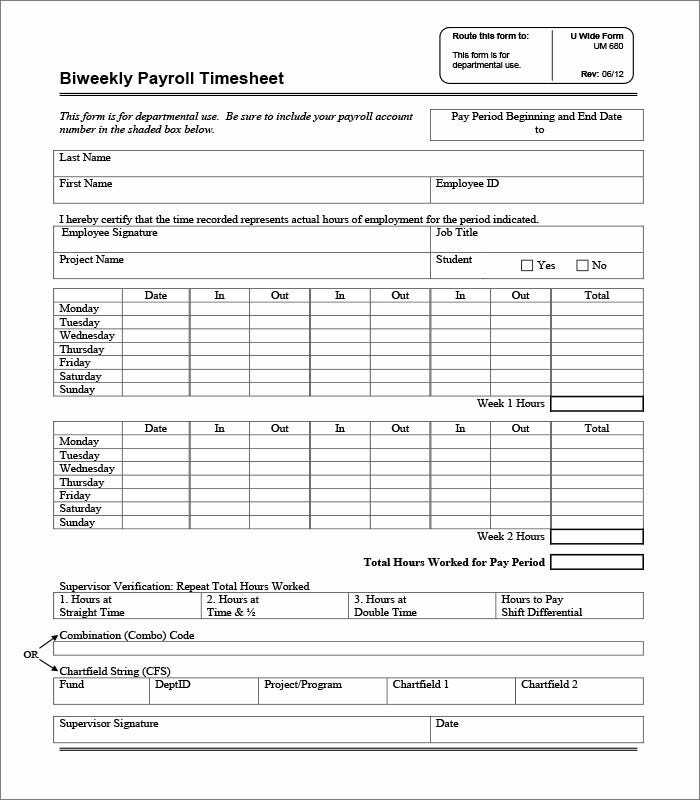 The payroll is completely transparent. 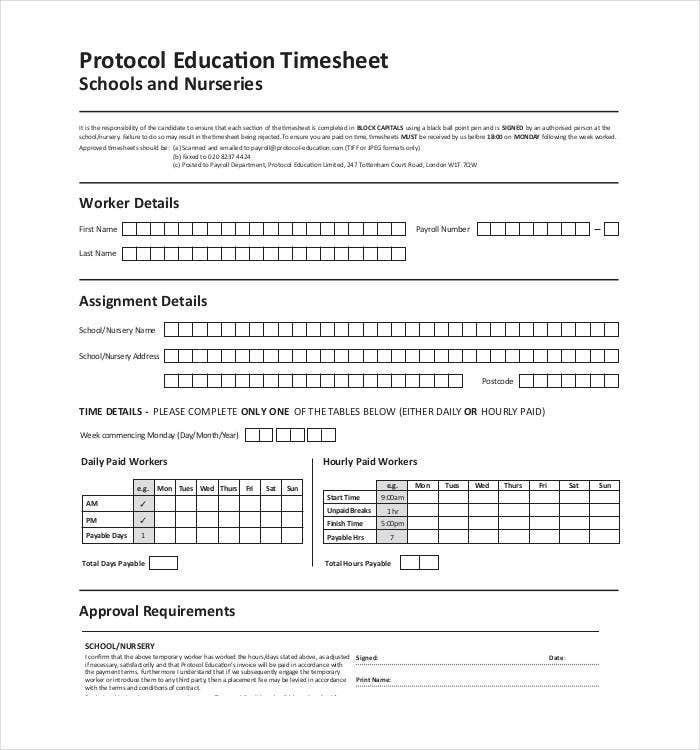 With the introduction of time sheet website, things have become easy for fast processing. While in professional life if you work without planning you may land up facing mismanagement and haphazard results. 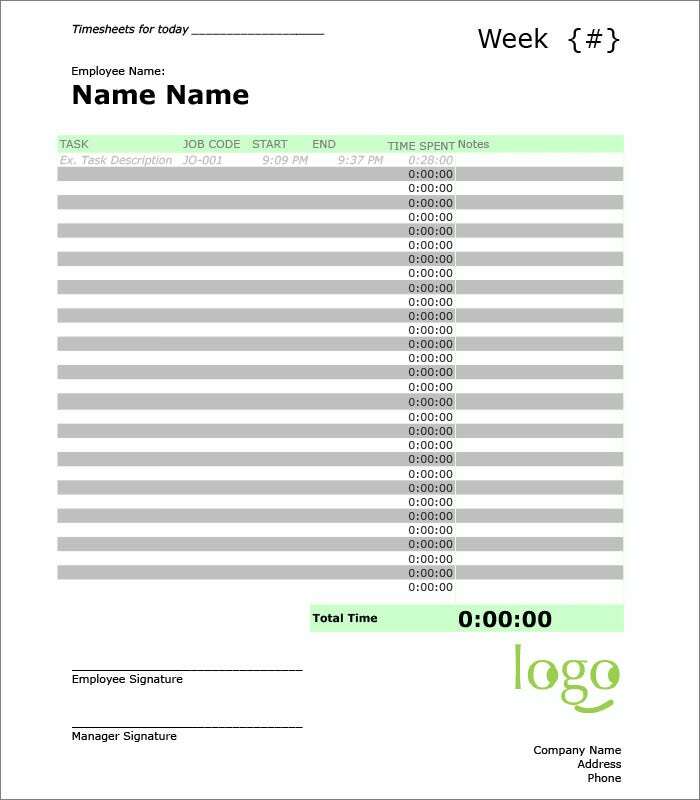 Our list of easy to use and ready time Sheet Templates are all set to save your time while tracking the employee engagement for a particular project. 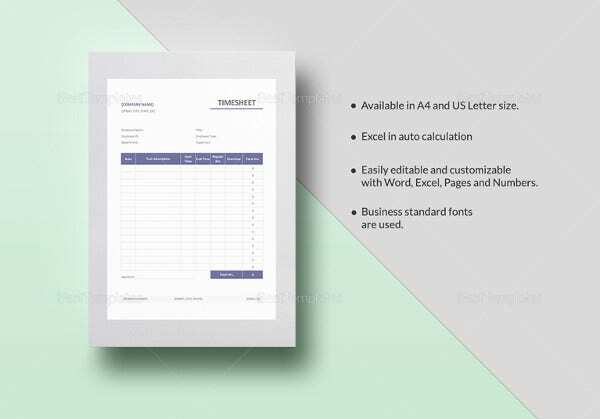 All the timesheet spreadsheet templates are available in user friendly formats making it more acceptable and reliable in a professional setup. 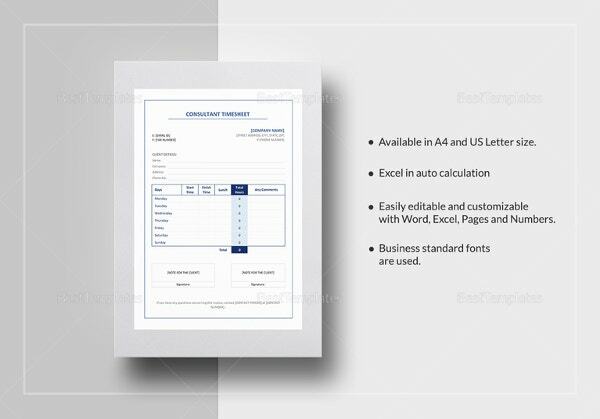 You may directly print them and use or download and customize as per your need before getting printed.